The Pillars of Creation, one of the most iconic cosmic bodies discovered to date, may now give us insight into how new stars are formed. Thanks to a survey of the Pillars of Creation, astronomers made a discovery that gives some new insights into the mechanism of how stars are formed. Among all astronomical pictures, arguably nothing quite captures the essence of the cosmos like that of the Pillars of Creation. All the beauty, mystery, and wow factor of the universe were immortalized by the Hubble Space Telescope in 1995 in this one stunning picture. Located in the Eagle Nebula, 7,000 light years away from us, these flyaway pillars are columns of stellar dust and gas that are five light years in length. The Pillars of Creation represent a star nursery within the Eagle Nebula where baby stars work their way up to the status of a full-blown star. 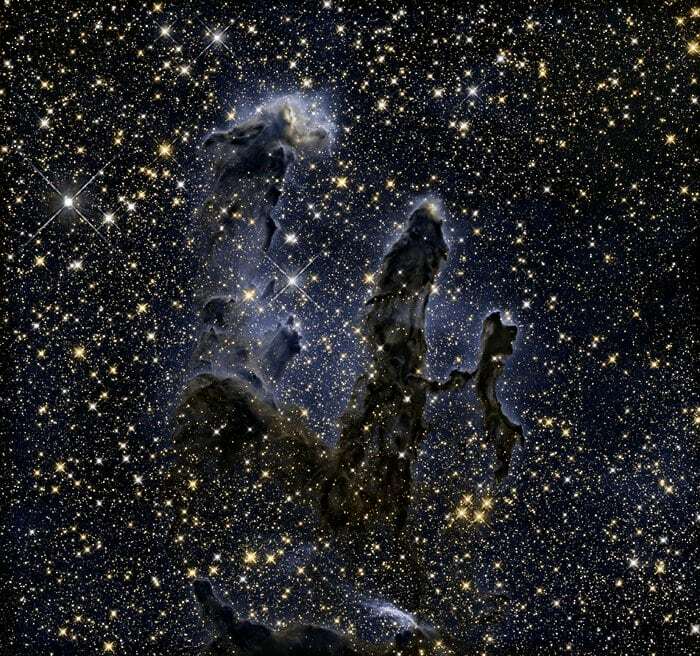 At first, astronomers thought the pillars were sculpted by the star-forming impetus. Then, a French doctoral student by the name of Nicolas Flagey challenged this belief. In 2007, Flagey suggested that the Pillars of Creation were destructed by a supernova some 6,000 years ago. That is, they were created by the death of stars instead of their birth. If this is the case, they should really be called the Pillars of Destruction, but that’s just semantics. Flagey’s assertion makes sense though because light from the Eagle Nebula takes 7,000 years to reach Earth. In other words, we see the Pillars of Creation as they were 7,000 years ago, a very long time before a supernova would’ve happened. Then again, the Pillars of Creation might not be all gone after all. Now, astronomers reveal that there’s more to the Pillars of Creation than meets the eye. An international group of researchers, led by the University of Central Lancashire (UK), said magnetic fields play a role in the shaping of the Pillars of Creation and the formation of stars within. The team, called BISTRO for B-Fields in Star-Forming Region Observations, used a sensitive polarimeter at the James Clerk Maxwell Telescope on Mauna Kea, Hawaii to arrive at their conclusions. Researchers were able to measure and map the weak magnetic fields inside the Pillars of Creation, which could explain why they stick at a different angle compared to surrounding matter in the nebula. The team also thinks that this magnetic assistance is instrumental in how stars are formed inside the Pillars. “This ground-breaking discovery suggests that the Pillars have evolved due to the strength of the magnetic field and that the Pillars are held up thanks to magnetic support, suggesting that stars could be formed by the collapse of clumps of gas being slowed down by magnetic fields, and resulting in a pillar-like formation,” said researchers. Results of the BISTRO Survey will be published in The Astrophysical Journal Letters with a pre-print version already available on arXiv.org. In the light of these new findings, should astronomers go back to reexamine other odd-looking nebulae?